Abstract: Background. Alzheimer’s disease (AD) is a leading cause of death in the developed world. Despite increased focus, there are no effective therapies; even the root causes of AD remain controversial. While amyloid plaques and tau tangles are thought key to pathogenesis, targeting these pathways has yielded little success. New targets, and new insights into disease development, are urgently required. We have analysed protein expression across six distinct regions of human AD-affected brains versus age-matched controls to reveal novel cellular mechanisms associated with disease. Methods. Matched brain tissue (n=9 per class) was acquired from the Auckland brain bank and six regions covering affected and ‘spared’ regions, namely hippocampus (HP), entorhinal cortex (ENT), cingulate gyrus (CG), sensory cortex (SCx), motor cortex (MCx), and cerebellum (CB) were dissected. Relative protein expression was determined by iTRAQ LC-MS/MS analysis followed by Bayesian statistics to determine differences between cases and controls. Pathway analysis (Ingenuity) and correlation network analysis (Moduland/Cytoscape) were subsequently performed to compare both disease vs. control and distinct brain regions. Results. Over 5000 proteins were quantified in total, with 1,903 quantified by ≥3 peptides in all six regions. Pathway analysis revealed neuroinflammation across the brain, albeit more marked in affected regions. Additional metabolic and signalling pathways were observed in more affected regions, in agreement with previous studies and suggestive of an ‘evolution’ through the organ. Strikingly, cerebellum, a region thought to be spared, exhibited a significant number of alterations in its proteome which were unique, and which could be protective against neurodegeneration in this region. Conclusions. 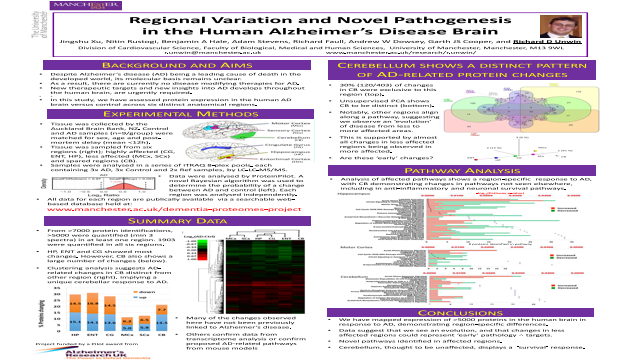 We have developed an in-depth picture of protein expression in late-stage AD, with some regions displaying what we believe to be an ‘early-AD’ phenotype, and an active protective phenotype in cerebellum. This provides critical new data on AD pathogenesis, and reveals new pathways for potential therapeutic targeting.